The state's grade is based on six factors: state academic standards, charter schools, homeschool regulation burden, private school choice, teacher quality, and digital learning. Because the Education and Workforce Task Force at ALEC focuses the most on private school choice and charter schools, those factors were given double weight in the calculation over overall rank and grade. The weighted grades were converted into a GPA average and an individual rank. View two states side-by-side to compare their education policies and achievements. The status quo is not working. Whether by international comparisons, state and national proficiency measures, civic literacy rates, or career preparedness, American students are falling behind. The 22nd edition of the Report Card on American Education ranks states on their K-12 education and policy performance. 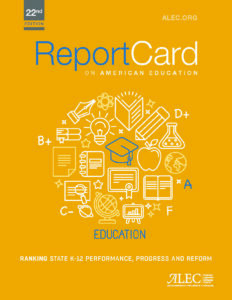 Report Card on American Education: K-12 Performance, Progress and Reform is published by the American Legislative Exchange Council (ALEC) as part of its mission to promote limited government, free markets and federalism. Copyright Education Report Card 2019. All Rights Reserved.